“A true multi-purpose product and make-up artist’s secret weapon, the cult Boiron Homeoplasmine ointment heals and protects dry and chapped skin. 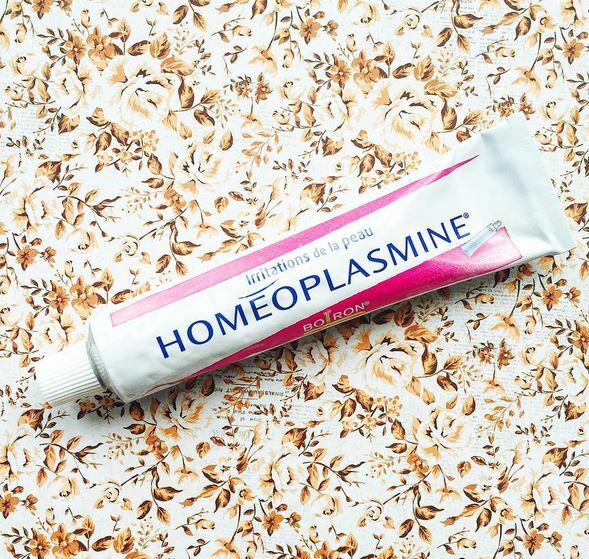 Antiseptic, decongestant and repairing, Homeoplasmine cares for damaged skin, working to alleviate irritation and restore calm. Basically, an effective, homeopathic, matte finish, lip balm with a base of vaseline aka petroleum jelly. It’s not heavy or sticky schmicky at all, has a pleasant smell and you need the tiniest amount. I tend to suffer from some really bad days with cold and blow my nose (as if it were to fall out). Obvious result to this gruesome exercise, is tender peeling skin near my nosey👃🏼. This bad boy really helps in soothing the skin because it basically coats the skin in thick layer of petroleum jelly. I’ve read reviews where people use it as primer (before base application). Personally, I would NOT use it as primer all over my skin. Ermmmm no bloody way! All in all, do you absolutely need this in your life? IMHO, nope! If you’re In France or Canada (sold as Cicadermine in 40g tube) it’s easily available but do you need to go out of your way to get it? Possibly not. Surely your life is already content with a lip balm that does its job. As for soothing tender irritated skin, we have several other options easily available in every country. As per the inci list, not exactly ground breaking….just saying! Yeah I find the texture a bit icky to use as a face primer but it does work well as a eyeshadow primer though! You’d think that Homeoplasmine would be readily available in countries outside of France as with most big name French pharmacy brands but oh well… one day! Hi Masuimi, honestly I wouldn’t apply anywhere near my face, lips, cuticles etc is all fine. French brands are notoriously difficult in terms of availability outside of France, but as you said hopefully one day…..
Mike for psoriasis you might need derm prescription to properly treat the skin. Homeoplasmine might not cut it. Nothing else helps soothing and healing my nose chapping beside Homeoplasmine so far. Just bought a Cicadermine since its seems like the new name for the product in Canada.